So looks like they were disappointed. what's a "hot pot" place? They always want to dumb it down for the white guy. They did do it Indian hot but that is the starting point for me. The good thing about the UK, you can access great authentic Indian restaurants everywhere. Same too Chinese. The only place to get decent Chinese food here is in China town. Otherwise you get something dumbed down and awful. There's a very good Thai called the Phuket near the harbour just before the beach. Good stuff. Szechuan hot pot: you get various meats, including SPAM(! 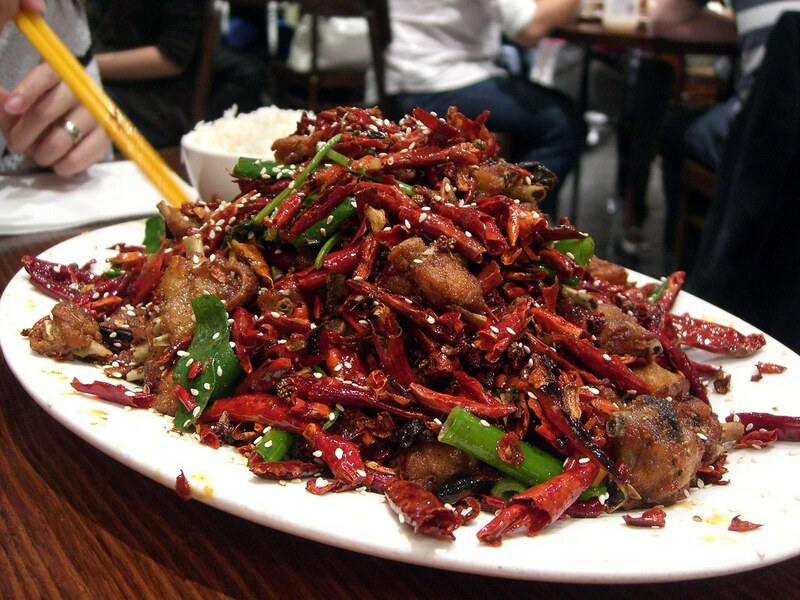 ), fish and are very spicy and you boil them in the hot pot one slice/piece at a time and then you eat. First time I had it was in Beijing and there's a restaurant here you can get it in, but would be too hot for my mob. neat. we don't have anything like that here. This is a local place here called Dainty Sichuan. There's a fair few chillies in that dish! Really? No Chinese steamboat/hot pot places? Similar to Japanese shabu shabu or sukiyaki, but generally spicier. I had Hot Pot at Peppers... and learned that Hot Pot is definitely not up my alley. Not because of the food, but because of my own preferences. We were seated at a larger table at Peppers and a gas burner was brought to the table, to sit on a glass rotating table top. The hot pot was then brought out: it is a metal pot, divided in half- one side had broth-only and the other side had broth with chili oil. Several oil-based "sauces" are then brought out, accompanied by chinese bowls, a spoon and rice. The waiter then brought out an array of seafood (shrimp, blue crap, squid, scallops, maybe octopus? ), some vegetables (spinach, some lettuce maybe- chinese noodles and tofu too) and frozen lamb and beef slices. There was also beef tendon and tripe that were supposedly amazing (I hate the stuff). We threw our desired food into the pot, waited for it to cook and fished it out with a basket spoon. Then- voila!- time to eat. Apparently the real treat is spooning out the broth at the end of the meal (it takes on the flavor of all the foods cooked therein) into the rice bowl, for some kind of flavored explosion. 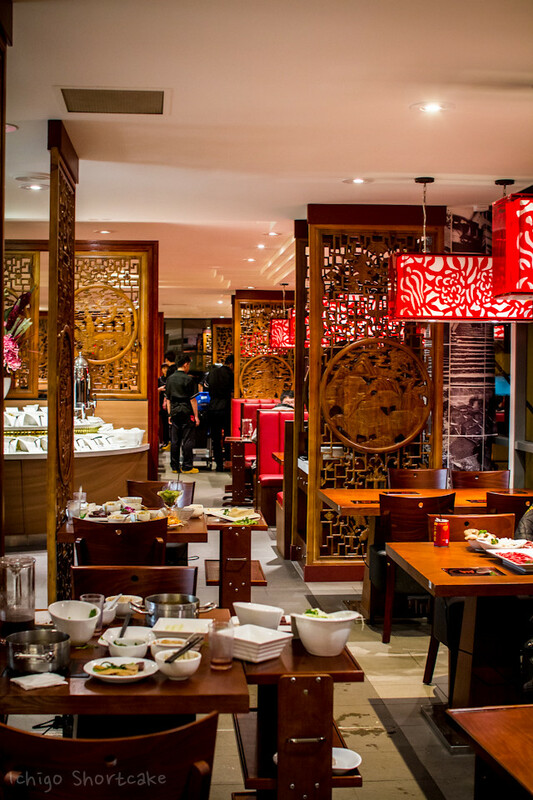 There were a lot of chinese people there, eating in the same style and, comparatively, it is supposed to be some of the best in So Fla. But for me, Hot Pot was a hard learning experience... I didn't like the oil-based sauces, seafood is not a big favorite of mine, the chili oil was too spicy (and I was eating with some spicy folks) and the exotic foods (beef tendon) were not my speed. I think it is more of a "me" thing- the real foodies at the table, including my chinese friend, raved about the quality of the products and foods. If I had to do it over, I would still do it again, but only because the experience was original and I can say I tried it. Next time we go out for hot pot, I'm ordering off the menu. Must be a new trend. A few of those places are just Asian restaurants near me that have added it to the menu. A couple of the other ones are new to me. Most others are all over the state. As you can see there aren’t many. Not really. It's like teppanyaki tables. It comes and goes. Koreans have their own version of it. The recent surge is due to the influx of mainland Chinese people. A lot of the interior provinces like spicy stuff. no no. i didn't mean it was a new form of eating. i meant it was a new dining trend in the market. they tend to float through when they're hot and then die off in a year or so. we get everything trendy and then the trends stop and the business either move on to the next thing or dry up. You mean karaoke bars are coming back? i don't think we have enough koreans to make that one worth while. The ones i go to are only about 3 ks from me - or 2 x train stops. Its predominately Chinese orientated area - I think around 30% of the popn there is Chinese born - and then you add the ABCs. The hotpot places have a small induction plate built into the table in front of each person - some others only have one big central one - and you order plates of meats and vegetables - the selection is truly wide and amazing - there will be 10 types of mush rooms f'rinstance. You usually share the raw ingredients. You can also go to the "flavouring"/Spice servery and choose you own extra flavours form about 40 or 50 - coriander, sauces, chopped peanuts, chilli paste, etc etc . The Hotpot its self has 2 x sides compartments - usually you fill one with a very spicey stock and the other with a less spicy but still flavourful chicken based stock. Sometimes theres 3 or 4 stocks but usually only 2. The pot is at the just simmering level. You choose a bit of raw stuff - say some wafer thin sliced beef/lamb/fish/pig and drop it in the stock, maybe some Asian greens too - not too many at once - wait a few seconds or a minute - then its cooked - you fish it out with your chopsticks and slurp eat. You usually have a bit of the soup too. As the meal goes on your stock/soup gets more flavoursome from what you've cooked in it - you have more soup - as it depletes they come around and top up the stock. Its a nice way to do group eating and only cook what you like and in the quantities you want. In these ones I go to sometimes you can be the only Laowai in the 100 seat palce. Theres no concessions to Guizi. So spicey here means nuclear. I nearly died once when I ordered the very spicey stock. My daughter likes it so much she has her own small portable induction plate at her home and just puts it on the table and has hotpot. Cooking 9lbs of monkfish liver in a small pan taking many hours now. Sounds like a good way to get your full dose of heavy metals for the week. Dol sot bim bim bap without the stone bowl? Freezing it all for next year, can only buy it during winter season. Metals aren't the big problem, plastics are. bacon wrapped turkey roulade stuffed with stuffing below. stuffing with apples, sausage, wild mushrooms, shallots, leeks, garlic, rosemary/thyme/sage. fresh baked bread was soaked in milk and pinot grigio. bacon cranberry sauce with shallots, leeks, garlic, thyme, honey, pinot grigio. gravy was scraping up brown bits off the pan, stadium mustard (a unique local cleveland type of mustard that's like a spicy german brown), garlic...made a roux with some flour and a big ol hunk of butter...deglazed the pan with the last of the pinot grigio...added some homemade smoked turkey stock i had in the freezer that was reducing for about an hour and let that all reduce down more for 10 mins while the roulade rested. ...one couple made the mashed potatoes, another brought a store bought pumpkin pie, this girl ive been seeing brought wine and put the fork on the wrong side of the plate. Is everyone else “Black Irish”? I've seen that chair before.